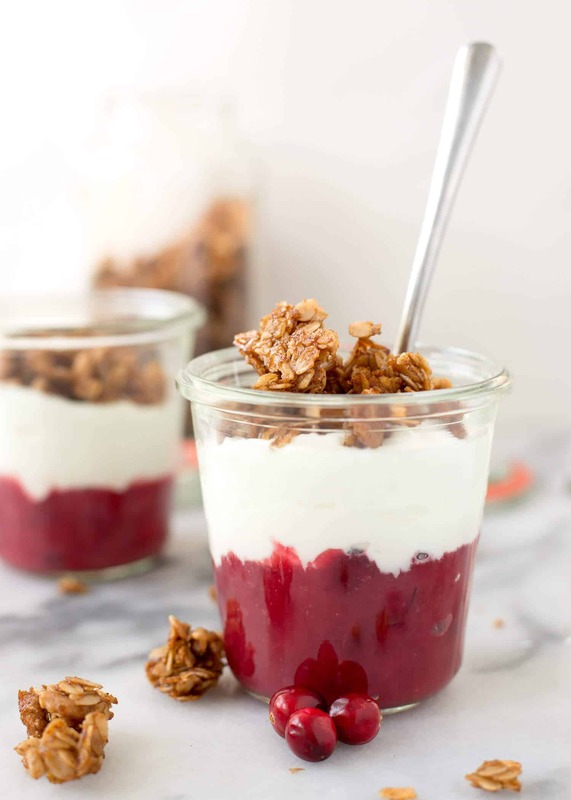 Cranberry Breakfast Parfaits! 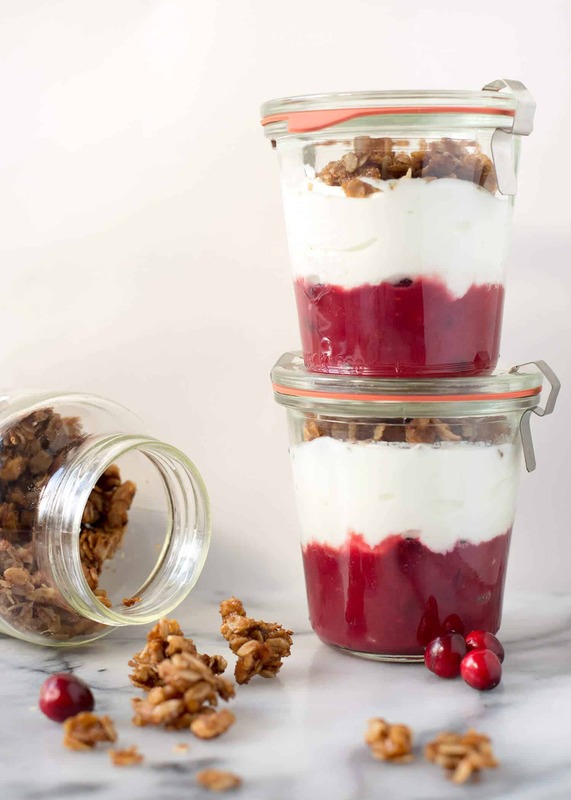 Layers of cranberry orange compote, greek yogurt and homemade spiced granola. Super easy and perfect for busy weekdays. You guys, Thanksgiving is next week! Like, less than 6 days away. What in the crazy, cray? I knew it was coming, I just didn’t realize how soon. Wasn’t I just eating my body weight in Halloween candy? After that, it’s full-blown Christmas extravaganza time. I realized all of this yesterday morning, after running into Target to grab a few items, and left with an overflowing basket of holiday decorations. Um, wasn’t I supposed to be practicing minimalism? I’ve been justifying the need for holiday pillows, sparkly couch throw, mantle decorations and embarrassingly more by the fact that this is the year we finally have a real house and my current christmas decorations can fit in a shoe-box. Now, I’m counting down the days until I can put up my tree and hang our stockings. Gaudy game on. Thankfully, I can spend my free time shopping for ridiculous decorations that I don’t need as my Thanksgiving responsibilities are non-existent. BL and I show up at my in-laws an hour before feast-time, sit down and enjoy. Perhaps I give the potatoes a stir as I mingle around the kitchen, but it’s kinda ironic that someone who loves food as much as I do rarely gets involved in the holiday that IS food. 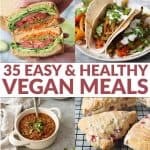 (But, if you’re currently in a cold sweat because of next week’s events, I’ve got 50+ vegan side dishes here for you to drool over and make). So, these breakfast parfaits! 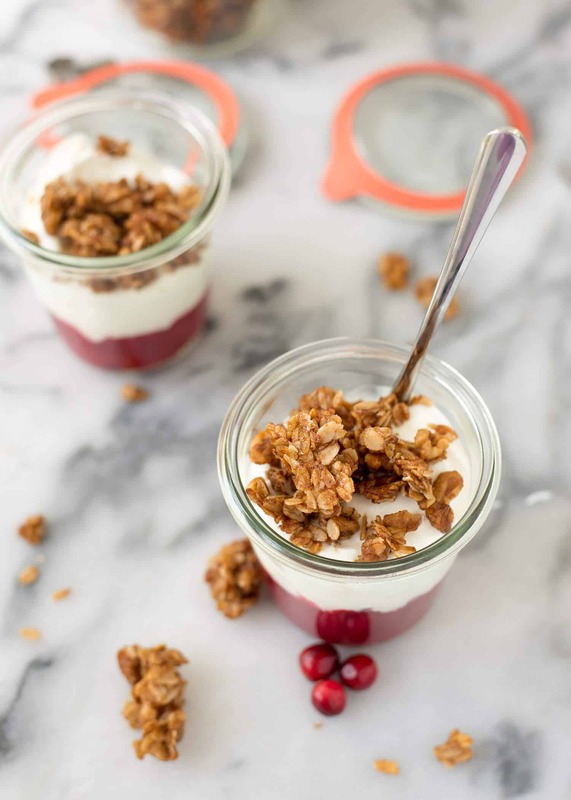 Layered with cranberry-orange deliciousness, yogurt and cinnamon spiced granola. If you are looking for a hostess gift for next week, I think this could be it. A bag of granola, maybe a few of these adorable jars and directions on what to do with all that leftover cranberry sauce. Sure, I’ve included my quick cranberry sauce recipe here but these little breakfast jars are the perfect way to use up leftover cranberry sauce. Throw it in the bottom, top with whatever yogurt you’d like and stash in the fridge. When you are ready to eat, sprinkle cover with spiced granola and chow down. I really love cranberries for breakfast. This steel-cut oatmeal with cranberries is super warming and perfect for cozy mornings and I’d like to this that these parfaits fit the bill as well. 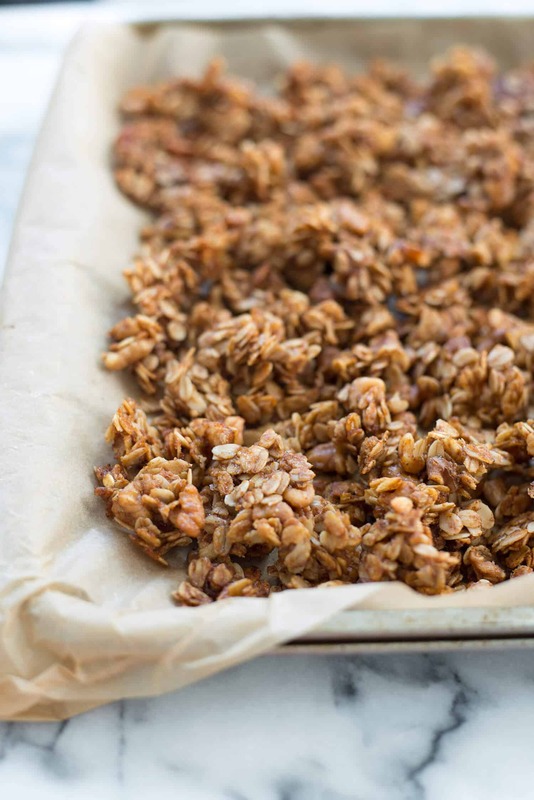 If anything, the granola is a must-make. Giant cinnamon clusters just waiting to be snacked on, topped with or sprinkled on. 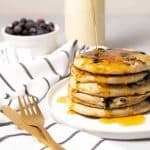 It also goes without saying that these can be made with any yogurt you choose. I’m partial to siggis & Maple Hill Creamery for different reasons. Siggis is low-sugar, maple hill is grass-fed. For vegan versions, I really like So Delicious coconut. What’s your favorite yogurt? Any almond milk varieties that you like? I really want to find one that tastes delicious, but so far they’ve all been duds. Sending you lots of cozy holiday vibes for the weekend! We randomly road-tripped to Louisville last night for a quick get-away. If you’ve got any must-visit places, I’d love to hear them! Make the granola. Preheat oven to 325 degrees F. Combine the rolled oats, walnuts, cinnamon, nutmeg, cloves, a pinch of salt and brown sugar in a bowl. Make a well in the center, then add in the honey and canola oil. Stir to combine until oats are completely wet and no dry clumps remain. Place the fresh cranberries and orange juice in a saucepan over medium heat. Stir often, until cranberries have burst and cooked through, about 10-15 minutes. Let cool. 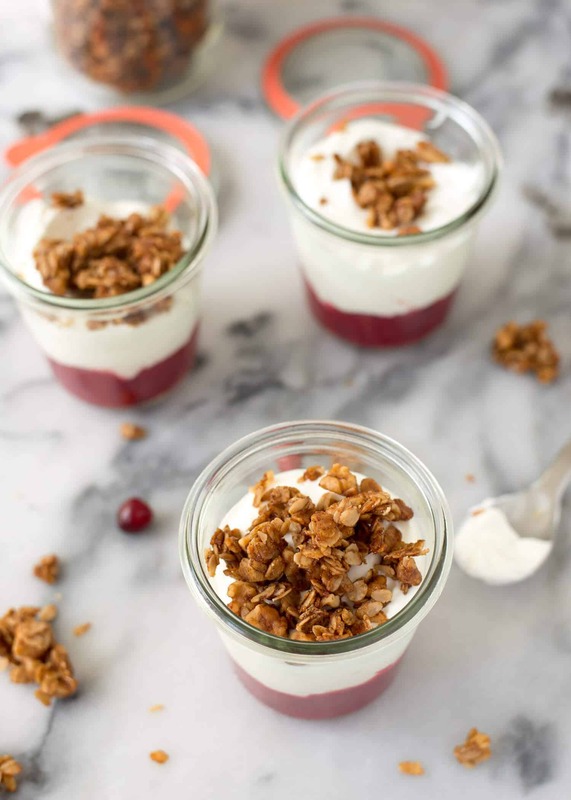 Divide cranberries in jars, then top with 1/2 cup yogurt. Top with granola. Um this looks stupid delicious. I’m gonna need to eat like 10 of these the weekend after turkey day! Found this searching for a way to use up cranberrries. Delicious. Will need to stock upon the cranberries.